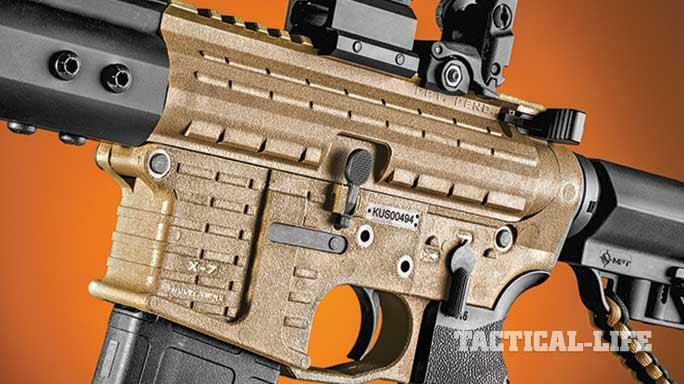 REIGN ON THE RANGE WITH KAISER SHOOTING PRODUCTS’ X-7 FUSION MONARCH— A DEPENDABLE AR RIFLE THAT WEIGHS JUST OVER 4 POUNDS! If you’ve ever hefted an M1 Garand, you probably thought something like “My God, those were tough men!” These rifles weigh a ton (about 10 pounds, actually) and by the end of the day, carrying one through the French countryside probably only made it feel a few pounds heavier. Zip ahead a few years ahead to the M14, the M1 Garand’s replacement, and you have a rifle that weighs about 9.3 pounds. That’s still a heck of a weight to carry, especially with ammunition and other items soldiers had to hoof while slogging through the jungles and swamps of Vietnam. So it’s no wonder that the need for a lighter combat rifle was pushed through, ultimately leading to the M16, which weighs approximately 7.25 pounds. Of course, a lighter rifle meant soldiers could carry more ammunition and field gear in their packs and pockets. 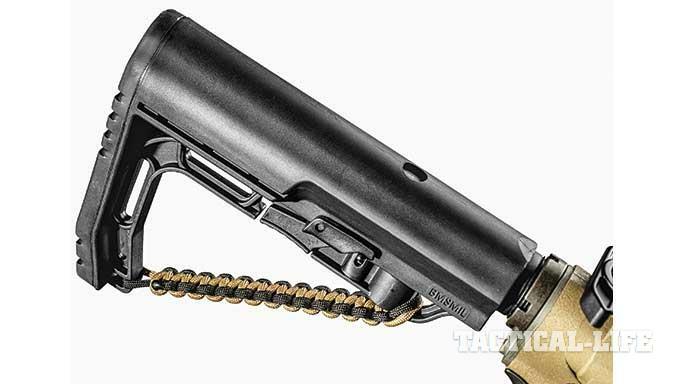 Although most shooters and law enforcement officers today would scoff at the idea of a 7.25-pound M16 as being heavy, most are quick to grab an M4-style carbine, which weighs about a pound less. Weight can really add up, especially for cops who have to guard a location or perimeter, in position for hours on end, or take a 500-round training class. The carbine may seem like it has gained lots of pounds. Folks have come up with a number of routes to lighten AR-platform rifles, including using polymer upper or lower receivers, or both. However, polymer frames have ridden a stormy sea of growing pains that has left many shooters disenchanted. In years past, these receivers have fractured or chipped easily, warped out of spec or exhibited elongated pinholes, to name just a few problems. But one company has a solution. KSP equips the X-7 Fusion Monarch with a titanium bolt carrier group housing a Carpenter 158 bolt. Born in 2005, Kaiser Shooting Products (KSP) began by offering shooting accessories for Glock pistols before transitioning to the AR world with innovative parts. Naturally, the attention to detail evident in Kaiser’s Glock product line followed into its newer AR interests. 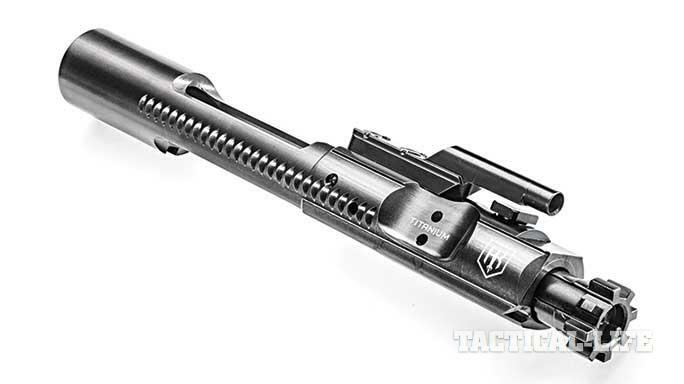 KSP’s products include a weight-saving titanium bolt carrier group (with or without Robar’s NP3 coating), stripped polymer receiver sets and complete ARs using the polymer receivers. Yes, you read that right: The company’s AR rifles and pistols use polymer upper and lower receivers. KSP uses a number of methods to overcome the problems other polymer receivers have exhibited. The receivers are injection molded using “virgin polymer, not regrind.” The polymer is “long and short strand glass infused,” which provides impact and shatter resistance. The receivers are also “match fitted from the factory for a supreme fit with zero action movement.” Finally, the company includes hardcoat anodized 7071-T6 aluminum inserts around the fire control group, takedown pins and buffer tube. In other words, these precisely fitted receivers are made of tough polymer, and all of the stress points are reinforced with aluminum. What an interesting concept. In fact, KSP claims its rifles have hit “50,000 rounds with minimal wear and no failures attributed to the receivers.” With all of this in mind, I was anxious to get my hands on one of the company’s rifles. The Monarch’s black-nitride-coated barrel comes with a Phantom flash suppressor from Yankee Hill Machine. 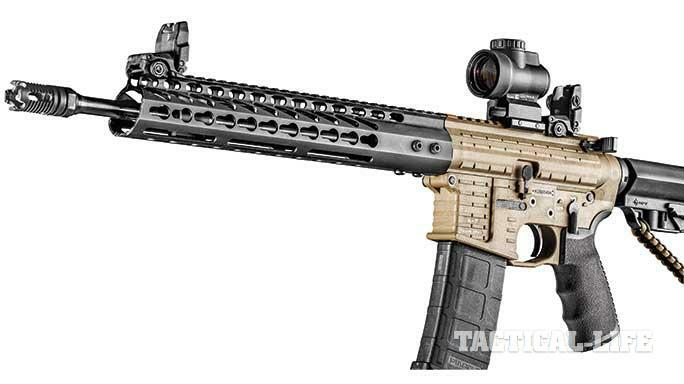 KSP offers two rifles in its X-7 Fusion line—the Standard and the Monarch. I received the latter for testing. And let me just say, when I picked up the Monarch’s box, I was shocked. It was so light in my hands that I thought the company had screwed up and shipped me an empty package. But they had not. The KSP X-7 Fusion Monarch weighs just 4.3 pounds unloaded, compared to the Standard model’s 5.5 pounds. The difference in weight can be attributed to the Monarch’s pencil barrel, though both use 16-inch, black-nitride-coated Faxon barrels. From prior experience I know that black nitride coatings actually penetrate the surfaces of the barrel, increasing the hardness of the metal inside and out. Many consider it superior to chrome lining. The Monarch also features a lightweight titanium carrier instead of the Standard’s mil-spec, black-nitride-coated carrier. Another difference between the models lies in their muzzle devices. The Monarch comes with a YHM Phantom flash suppressor; the Standard sports an A2-style flash suppressor. KSP’s polymer receivers feature reinforcing 7075-T6 aluminum inserts at common wear points. Both models come with KSP’s X-7 Fusion polymer upper and lower receivers fitted with mil-spec trigger groups, mil-spec charging handles made from hardcoat anodized 7075-T6 aluminum, Carpenter 158 bolts and mil-spec, six-position buffer tubes. KSP says very little lubrication is required for the rifle’s moving parts because of the enhanced lubricity of the polymer used in the receivers, and that none is required if the NP3-coated bolt carrier group is chosen. Both rifles also feature KSP’s aluminum Slimline KeyMod handguards. The Monarch’s is 15 inches long while the Standard’s is 12 inches long. These handguards are narrow and comfortable in hand, and the numerous KeyMod slots provide a second benefit of aiding barrel heat dissipation. Externally, the upper and lower receivers (available in black or Flat Dark Earth) have special texturing with raised rectangular horizontal grooves cut into rectangles of various lengths. In hand, these grooves were effective in providing a secure grip, especially at the front of the magazine well, and this texturing should work well for users with wet hands or those wearing gloves. Speaking of the magazine well, each rifle ships with a single Magpul PMAG. 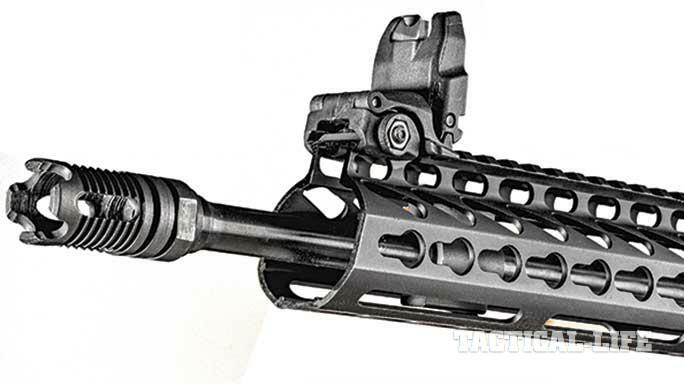 Mission First Tactical’s adjustable Minimalist buttstock comes with 8 feet of braided paracord tied to the underside. The lower also features an end plate with a single quick-detach (QD) sling-mounting point and an integral, enlarged triggerguard. My test rifle’s single-stage trigger broke nicely at 6.5 pounds, and the six-position buffer tube was equipped with the Battlelink Minimalist stock from Mission First Tactical (MFT) with 8 feet of braided paracord tied to its underside. Another thoughtful touch, the buffer tube positions feature white numbers that are visible through a small port on top of the stock. For a grip, KSP chose MFT’s Engage EPG16, which has pebble texturing, finger grooves that actually fit my hand and a sealed storage compartment. The black handguard, stock and pistol grip contrasted nicely with the Flat Dark Earth receivers. Finally, my test rifle came with Magpul MBUS backup sights, which KSP offers for an extra $90. In keeping with the Monarch’s theme, I kept the accessories to a minimum. 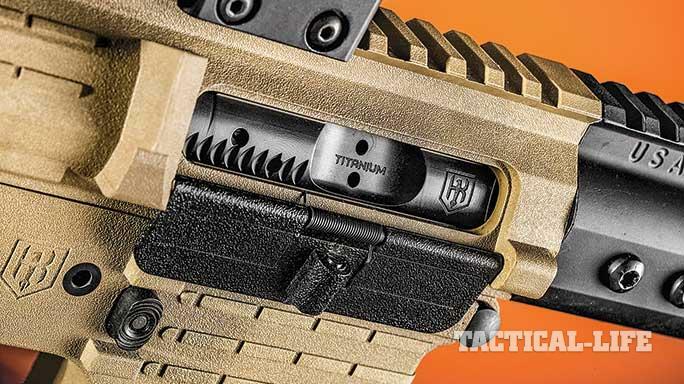 For a sight I chose Trijicon’s Miniature Rifle Optic (MRO), an excellent example of a compact reflex sight that weighs only 4.1 ounces before adding a mount. Of course, you need a light to see the target as visibility falls off, and the Crimson Trace Rail Master Pro includes a 100-watt LED as well as a red or green laser. The light and laser can be activated and deactivated simultaneously. The Rail Master Pro weighs a mere 3.6 ounces. My final addition was a single-point sling from Blue Force Gear. At the range, the rifle’s accuracy was excellent off the bench with each load I tested, though only one met KSP’s sub-MOA accuracy guarantee. The other loads created groups just over an inch wide at 100 yards. In someone else’s hands, or on a different day, I suspect the results could have been different. I used a Leupold 4.5-14x scope for the accuracy portion of the evaluation, but with that accomplished, it was time to run the carbine through a few exercises. Switching to the MRO, I began working on a few drills from 10 to 50 yards. The Monarch handled well thanks to its light weight, especially by the end of the exercises. With heavier ARs, I am usually aware of their weight by the time I’ve popped off around 200 rounds. With the KSP X-7 Fusion Monarch, I was only aware of its lightness. The same remained true on my other range excursions. Throughout everything, the Monarch ran like a top. However, the bolt would sometimes fail to lock back after firing the last round in a magazine. I spoke to KSP, and the company said that it had received a batch of bad bolt stop levers with improper radii, and KSP believed it had found all of them. Replacement would easily solve my problem. Even the dust cover on the X-7 Fusion Monarch is polymer to save every last ounce of weight. KSP claims that the magazine wells on its X-7 Fusion receivers “will flex and revert back to shape if crushed.” While I did not drive over my test rifle to see if the magazine well was that resilient, I see no reason to doubt KSP’s claim. Another point worth mentioning is that KSP claims its X-7 Fusion receivers are designed to fit mil-spec parts. There are “no proprietary parts barring the dust cover”—another good thing to hear. I have no doubt the KSP X-7 Fusion Monarch has a bright future in the civilian and law enforcement worlds. In fact, several local agencies are already using X-7 Fusion rifles right now. They’re light, accurate and dependable. What’s not to like? For more information, visit http://www.kaiserus.com or call 520-561-8227. This article was originally published in the October/November 2016 issue of ‘Guns & Weapons For Law Enforcement’. For information on how to subscribe, please email [email protected]outdoorgroupmags.com or call 1-800-284-5668.